Table 7-2-5-4 shows the status of re-admission (refers to re-admission through a decision to commit them to a juvenile training school; hereinafter the same in this subsection) or admission to a penal institution (refers to admission as a first-time inmate; hereinafter the same in this subsection) among juveniles discharged from juvenile training schools between 1999 and 2008. The percentage of those who had been re-admitted within five years, inclusive of the year of discharge, was 16.0 to 17.4% (16.8 to 18.1% of males, 6.7 to 10.5% of females), while the percentage of those who had been admitted to a penal institution within five years, inclusive of the year of discharge (the year of the last discharge for anyone admitted multiple times), was 8.7 to 9.6% (9.3 to 10.7% of males, 1.5 to 3.2% of females) (Source: The Judicial System Department, Minister’s Secretariat, Ministry of Justice). Fig. 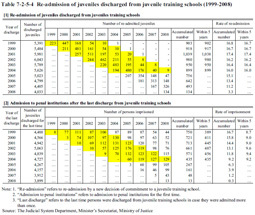 7-2-5-5 shows the percent distribution of juveniles newly admitted to juvenile training schools in 2008 by relationship with a delinquent group (with/without and level), guardianship status, and education/employment status of juveniles admitted for the first time (refers to those who had been admitted to a juvenile training school for the first time; hereinafter the same in this subsection) and juveniles re-admitted (refers to those who had previously been admitted to juvenile training schools; hereinafter the same in this subsection). 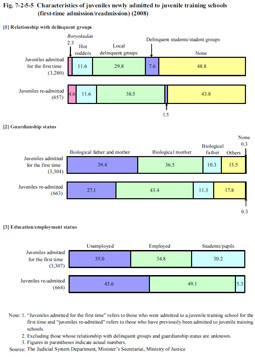 The proportion of those who had a relationship with a Boryokudan or local delinquent group, those whose guardian was not both their biological father and mother, and those unemployed was high among juveniles re-admitted when compared to juveniles admitted for the first time.